Fiji's military leader Frank Bainimarama has opened a meeting called "Engaging the Pacific", after a broader conference was cancelled. The Melanesian Spearhead Group summit (MSG), set for this week, was cancelled over participants' fears of a lack of democracy in Fiji. Mr Bainimarama had accused Australia of working to cancel the MSG. Last week Fiji expelled the Australian envoy, in a move linked to the MSG summit row. 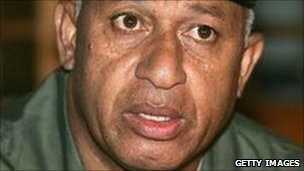 Mr Bainimarama, who seized power in a 2006 coup, says elections will not be held until 2014. Mr Bainimarama told his new conference, attended by 10 island states, that they need to triumph over their colonial past. "The vision to modernise, break the shackles of the past and challenge the status quo will always make some around us uncomfortable," he said. "There will be disquiet, even a sense of foreboding by some. However, we as leaders cannot be deterred from the vision. "We must not give in to political or economic expediency for the benefit of only the few." Participants include the Solomon Islands, Kiribati and Tuvalu, Vanuatu, Tonga, the Federated States of Micronesia, the Marshall Islands, Nauru and East Timor. Papua New Guinea's Prime Minister Sir Michael Somare is also expected to arrive. The military leader told The Australian newspaper that what he called Canberra's diplomatic effort against the MSG had backfired. He accused Australia of trying to undermine his authority and embarrass Fiji. Since he took power, Fiji has been expelled from the Commonwealth and the Pacific Islands Forum. The European Union, the United States, Australia and New Zealand have all imposed sanctions. Mr Bainimarama has cancelled the constitution, sacked the judiciary, expelled journalists and introduced laws to take local ownership of the Murdoch-owned Fiji Times.